Comprehensive review of Dymatize ISO100 Protein Powder. See what real experts and actual users have to say about this protein powder. I really like Dymatize ISO100 Protein Powder and gave it 4 out of 5 stars. The company goes the extra mile and makes a very high quality protein powder. It uses 100% hydrolyzed whey protein isolate, which is super fast digesting. It’s also ultra filtered, so you’re left with purer protein that has the extra fat, lactose, cholesterol, and carbohydrates removed. The amino acid profile is great and may really help boost your workouts, muscle building, and recovery. There are 11.8 grams of essential amino acids; of those are 5.5 grams of BCAAs, including 2.7 grams of Leucine. These amino acids are specifically for activating muscle protein synthesis. It also has 4.4 grams of Glutamine, which supports muscle recovery. 6.5 grams of non-essential amino acids are also included that provide the building blocks for muscle. The protein is from high-quality, pure, intact proteins. They don’t amino spike their formulas. I think this protein powder tastes great and is very easy to use. You can also take it before or after workouts, or any time throughout the day to help with your protein needs. It’s low carb, low fat, and low sugar. 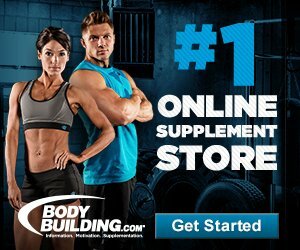 This is great for those eating clean and looking for lean muscle mass. It’s gluten free and also banned substance tested. I felt great while taking this protein powder and didn’t have any icky side effects or bloating. It does contain milk and soy, so be aware if you’re allergic or sensitive. I think Dymatize ISO100 Protein Powder is a great protein powder and has some great things to offer. 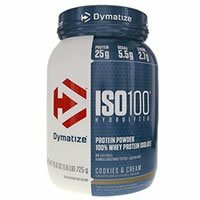 Dymatize ISO100 Protein Powder is incredibly easy to use. Just mix 1 scoop of protein with 5-6 oz. of water, milk, or your favorite beverage. It blends up in a pinch and is very smooth, without any chunks or grit. You can even mix it with a spoon, which I love! It’s definitely one of the easier to use powders out there. The flavor I tested was Fudge Brownie. I definitely love this flavor and think it tastes great. It reminds me of chocolate milk when mixed with water. When I mixed it with almond milk, it tastes more like a chocolate milkshake. Both ways taste great, especially if you’re a fan of chocolate. The macros for each serving of Dymatize ISO100 Protein Powder are as follows: 25 grams of protein, 0.5 grams of fat, and 2 grams of carbohydrates. It has 120 calories per scoop, which is 1 serving. This protein powder offers solid macros and is great if you’re looking for lean muscle building. It’s low carb, low fat, and low calorie, and low sugar for those following a clean diet. The total grams of protein may help with muscle strength and size, performance, and recovery from strenuous workouts. I really like the ingredients in Dymatize ISO100 Protein Powder. It uses 100% Hydrolyzed Whey Protein Isolate, which is an extremely high quality protein. This protein is very pure and goes through a cross-flow micro-filtration, multi-step purification process. What’s left is quality protein and the excess carbohydrates, lactose, cholesterol, and fat are removed. So it has what we want and removes what we don’t! This protein is also really fast digesting so your body can put the muscle building amino acids to quick use. It has 5.5 grams of BCAAs (Branched Chain Amino Acids), including 2.7 grams of L-Leucine, which stimulates protein synthesis and reduces protein breakdown. It also has 4.4 grams of Glutamine, which supports muscle recovery after strenuous workouts. Each serving also includes 6.5 grams of non-essential amino acids, which are the building blocks of muscle. This protein powder is low in carbs, sugars, calories, and fat. It has zero grams of lactose and is gluten free. While taking Dymatize ISO100 Protein Powder, I didn’t see any negative side effects or symptoms. This is awesome and I was very happy. I felt great and wasn’t sluggish or bloated after drinking it. It has soy and milk, so just be careful if you’re allergic those either. It uses a natural sweetener, stevia, and an artificial sweetener, sucralose. Sucralose may cause a little belly pain in some people. We think Dymatize ISO100 Protein Powder is best used for those wanting to build muscle size and strength. Each scoop offers 25 grams of protein, which may really help the body with muscle growth, performance, and recovery. It may even support those gym goers involved in serious resistance-training programs. You can take it before workouts, within 30 minutes after workouts, or at any time during the day to help reach your daily protein needs. For a 1.6 lb. container of Dymatize ISO100 Protein Powder, it costs $29.99. Once you factor in the servings and total grams of protein, it works out to 5.21 cents per gram of protein. That’s really reasonable and even less expensive than your average protein powder. I wish you could get a full month of servings (it only has about 23 servings), but I still think it’s a good value for the price. I would definitely buy this protein powder again. I couldn’t find any sort of guarantee for Dymatize ISO100 Protein Powder on their website. If you email or call customer service, sometimes they offer a guarantee that isn’t listed on the website. However, if you buy it from certain retailers like Amazon, you may be able to return it and get your money back if you aren’t happy with it. To buy Dymatize ISO100 Protein Powder, click here. Taste The fudge brownie flavor tastes great.